In any case, the spokesman said that Sinquefield's apparent aim was to show how much the city has lost in population, which the financier contends is linked to the earnings tax. The Census Bureau set the city's population in 2010 at 319,294. 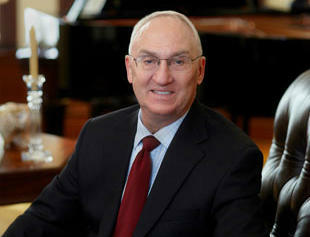 Until Sinquefield's donation, the campaign committee last reported $40 in the bank. Its deputy campaign manager is lawyer Marc Ellinger, who often has worked on Sinquefield issues. The city’s 1 percent earnings tax is paid by anyone who lives or works in the city of St. Louis. The tax provides about 40 percent of the city government’s revenue and has been in place in its current form since 1959. Backers, led by Mayor Francis Slay, say the earnings tax is necessary to finance city government operations, which affect all those who work in the city as well as those who live there. Opponents say the tax is unfair to low-income people and non-residents. Sinquefield, who has a home in the Central West End, has maintained for years that a higher land tax was fairer. Sinquefield had been the prime donor of the 2010 statewide ballot measure, passed by voters, that bars any additional cities from approving an earnings tax. St. Louis and Kansas City were allowed to retain their existing earnings tax, but it must be approved by those cities' voters every five years. St. Louis voters overwhelmingly supported the tax in 2011. If St. Louis voters reject the earnings tax on April 5, it would be phased out over 10 years. Meanwhile, the Missouri General Assembly is considering a bill that also would end St. Louis' earnings tax, but allow Kansas City to keep its tax in place. That bill's chief sponsor is state Sen. Kurt Schaefer, R-Columbia, who also chairs the Senate's appropriations committee.